“Digital_Humanities is a compact, game-changing report on the state of contemporary knowledge production. Answering the question, “What is digital humanities?,” it provides an in-depth examination of an emerging field. This collaboratively authored and visually compelling volume explores methodologies and techniques unfamiliar to traditional modes of humanistic inquiry–including geospatial analysis, data mining, corpus linguistics, visualization, and simulation–to show their relevance for contemporary culture. Included are chapters on the basics, on emerging methods and genres, and on the social life of the digital humanities, along with “case studies,” “provocations,” and “advisories.” These persuasively crafted interventions offer a descriptive toolkit for anyone involved in the design, production, oversight, and review of digital projects. 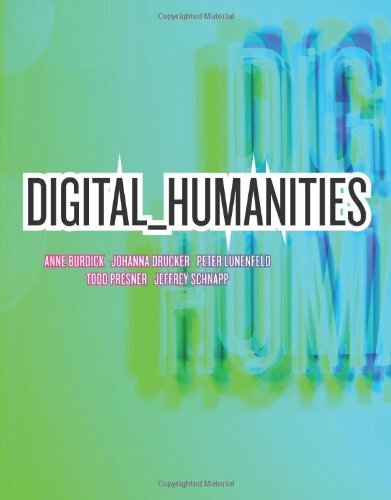 The authors argue that the digital humanities offers a revitalization of the liberal arts tradition in the electronically inflected, design-driven, multimedia language of the twenty-first century.